On August 14, 1997, Miky Suarez, now president and majority owner of Rio Rico, AZ-based MAS Melons & Grapes, LLC, along with four quality-driven Mexican growers, took the decision to become partners and established a vertically-integrated agribusiness, aimed not only at exporting and marketing melons, watermelons, grapes and squash in the US but abroad. Two months later, in October, this partnership commitment was officially celebrated by Miky and his Caborca, Sonora-based grower partners, Alberto Vanegas, Carlos Terminel, Alfonso Ruysanchez and Rodrigo Acuña, during the 1997 PMA Fresh Summit convention and exposition held in New Orleans, Louisiana, city where, coincidentally, this event will be held again this year. 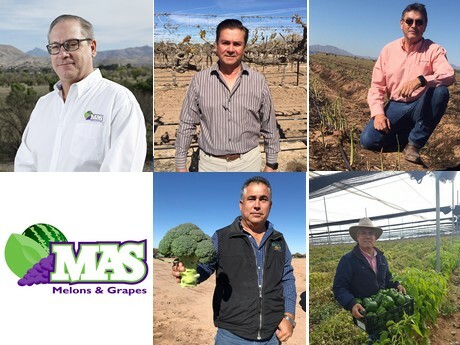 Today, the company has evolved as an exporter of melons, grapes, squash, asparagus, cucumbers, avocados and broccoli to the North American, European, Oceanian and Asian markets, with allied growers in more than ten growing locations in Mexico, including Hermosillo, Guaymas, Ciudad Obregon and Navojoa in the state of Sonora, Culiacan in the state of Sinaloa, Santiago Ixcuintla in the state of Nayarit, Tecoman and Armeria in the state of Colima, Tacambaro in the state of Michoacan, Leon and San Luis de la Paz in the state of Guanajuato. “In Spanish MAS means more and this is exactly what we have focused on over the last 20 years”, said Miky. “Our company has invested in having an expanded product portfolio sourced from strategically located growing areas across Mexico, in state-of-the-art packing facilities and equipment, in global outreach and improved customer service through additional sales staff and offices, and in achieving internationally recognized food safety and quality certifications”, he added. As a way to communicate the evolution undertaken by the company, MAS Melons & Grapes has hired a marketing consulting firm to refresh its corporate brand identity while strengthening its visibility to better reflect its position as a leading grower and marketer in North America. “Our reputation as an integrated growing, shipping and exporting operation, along with our new brand identity, will help redefine our global presence to closely align us with our diversified fresh produce production throughout Mexico and other countries,” added Miky. “To enhance our new corporate brand identity communication, we have come out with a new customer-oriented tag line: Expect More?.. Expect MAS! To help convey the essence of our company to the global produce supply chain”, Miky said.